Millions of years of history, which can be found on the ocean floor, are collected and analyzed at the Core Repository in New York. As the earth’s climate changes, one tool for understanding its environmental impacts is the study of past climate changes, revealed by layers of sediment scientists take from the sea floor. 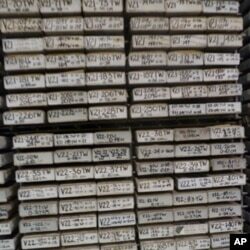 At the Lamont-Doherty Earth Observatory in Palisades, New York, frozen samples of those sediments are housed in a facility called the Core Repository. Lamont research professor Maureen Raymo, the director of the Core Repository, slides open a long, narrow drawer from the cabinet. Like thousands of others here, the drawer contains a long, thin cylinder of layered sediment. 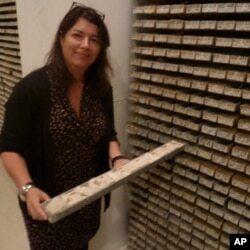 Core Repository Director Maureen Raymo pulls out a sea sediment sample, one of thousands at the archive. It’s a sample extracted from the ocean floor and below. According to Raymo, the cylinder’s distinctive stripes of varied colors and widths are a unique visual record, a sort of vertical time capsule. Lamont-Doherty oceanographic vessels started collecting these samples more than 50 years ago, at a time when no one was sure what they would be used for. Core sample labels identify the exact spot on the sea floor where the sample was taken. Slight variations in location can make a significant difference in the chemical and biological composition of the sediment sample. The core samples provide a reliable record partly because the deep ocean is a very peaceful place, compared to the shoreline. Looking at climate changes of the past helps scientists understand the changes the earth is undergoing today, and is nearly certain to experience at an accelerated rate in the future. Raymo says that when she was a doctoral student in the 1980s, climate change was an esoteric subject few considered relevant.